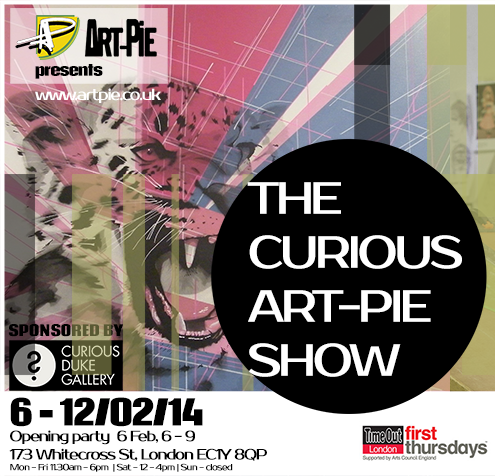 Art-Pie, sponsored by Curious Duke Gallery (CDG) have asked the public to vote in a top 50 of artists in our open submission competition for unrepresented artists to win a chance to exhibit their work in The Curious Art-Pie Show in February 2014, in CDG’s East London space. The voting period, which happened in December 2013, was fierce and the quality of the works that was submitted rocketed beyond our expectations. We got work ranging from drawing, painting to sculpture and now we have it – our final show line up of 21 artists! The top 3 rated entries got automatically included in the show line up while we asked a bunch of established artists – Dan Baldwin, Pam Glew, Dave White, Andrea Tyrimos and Static to give us their personal selections.